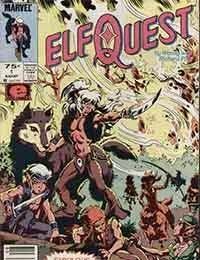 The Epic ElfQuest issues are reprints of the original series published by WaRP Graphics. The original series was 36 pages per issue and the Epic series 22, requiring new pages to be added to nearly every issue to aid the transitions. It is the story of how Cutter Kinseeker brings his Wolfriding tribe through the desert, caves, mountain to unite the elves of Abode and find the Palace of The High-Ones.